A former Premier League referee from Lancaster is to retire after more than 40 years of service to the professional game. Dave Allison was a respected match official before going on to hold several roles at the Football League. Dave Allison in November 1993 trying to maintain order in the Southampton v Tottenham Hotspur game at the Dell. 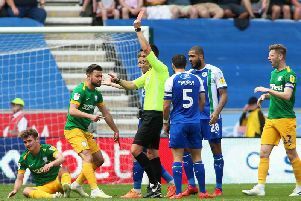 The 70-year-old was then appointed as the Professional Game Match Officials Limited national group director in 2007 where he has provided support to officials throughout the Championship, League One and League Two. He is now taking up an advisory role before hanging up his whistle for good at the end of the 2018-19 season. “Football owes me nothing, I’ve had a wonderful time throughout my career – both whilst refereeing and as part of the PGMOL,” said Allison, who started refereeing in the Morecambe and Lancaster Sunday League. “I have memories and friendships that will last a lifetime and I am truly grateful for the opportunities I have been given. “I would like to thank my family, especially Sheila, my friends and everybody I have had the pleasure of working alongside over the years and wish them all the very best for the future. “The role of a referee has changed dramatically over the time I’ve spent in the industry. Allison’s Football League career began as a linesman in 1977, the Lancaster official being promoted to the referees’ list three years later at the age of 31. He took charge some of the biggest matches in the English calendar during his 20 years as an official, including the 1996 Division One play-off final between Leicester City and Crystal Palace. Allison retired from duties on the pitch a year later with more than 450 matches, including regular outings in the Premier League, under his belt. His Football League work saw him operate as regional co-ordinator and a referees’ coach before his appointment with the PGMOL 11 years ago. There Allison has helped oversee the professionalisation of referees and the introduction of new initiatives such as goal-line technology and VAR. EFL chief executive Shaun Harvey said: “The game has changed dramatically during Dave’s long and valued career and his continued influence over so many years is testament to his ability to adapt and implement new ideas so effectively.